Fifth disease, also known as erythema infectiosum, or slapped cheek syndrome, is an infectious disease caused by parvovirus B19. It affects mainly children 4 to 12 years of age. During incubation, which lasts for about 10 days, the patient is contagious and may display a number of ailments: mild fever, runny nose, headache, sore throat, joint pain, etc. 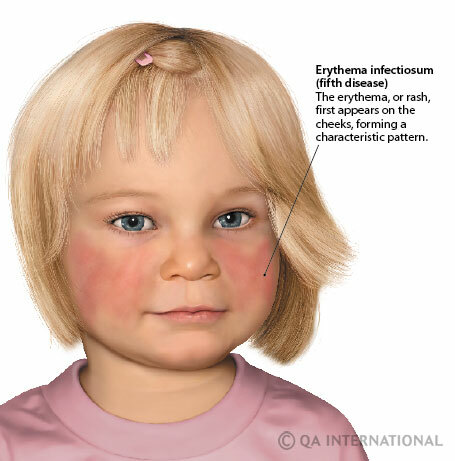 An erythema (rash) then appears on the cheeks before spreading to the limbs, the torso, and the buttocks. These symptoms fade spontaneously after 10 days. Fifth disease is usually benign, although it can be more dangerous for the immunodeficient, those suffering from sickle-cell anemia, and pregnant women, due to the risk of miscarriage. Fifth disease got its name from the fact that it was the fifth infectious disease characterized by rashes to have been discovered in a group of six similar pathologies. Other than fifth disease, this group also includes measles, rubella, scarlet fever, Dukes' disease (whose symptoms resemble those of rubella and scarlet fever), and roseola (sometimes referred to as sixth disease). Rubella is an infectious disease caused by a virus from the Rubivirus genus, and mainly affects children and adolescents. After 15 to 20 days of incubation, the disease can appear as a moderate fever, swollen lymph nodes in the neck, headache, sore throat, and conjunctivitis. An outbreak of slight raised, small rosy spots will appear two days later. Rubella is benign, except in pregnant women who were not immunized at the start of their pregnancies, because it may cause severe malformations in the fetus. Systematic vaccination against rubella has caused it to decline considerably, and it may be completely eradicated in coming years. 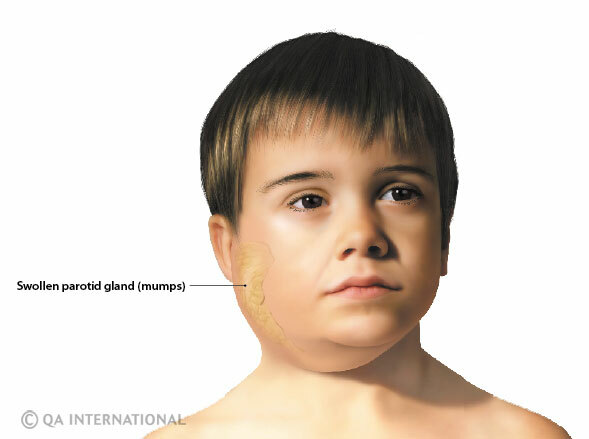 A highly contagious infectious disease caused by a virus from the Rubulavirus genus, mumps leads to inflammation of the parotid salivary glands, located in front of the ears. The disease most often affects children ages 4 to 5, although it can also appear in older children and adults. After about three weeks of incubation, mumps can cause moderate fever, headache, and painful, sometimes spectacular, swelling of the neck. The patient, who is contagious during the week before and after onset of the symptoms, will recover spontaneously after 10 days. In some cases, the virus also affects the meninges and the testicles, which can lead to sterility in pubescent boys and adult men. Whooping cough is a highly contagious infectious disease caused by the Bordetella pertussis bacterium and affecting the respiratory system. Although it has become relatively rare in industrialized countries, thanks to the widespread vaccination of children, it is still common in developing countries, causing 300,000 deaths each year. The first symptoms appear after about one week of incubation: runny nose, moderate fever, and dry cough, sometimes followed by vomiting. The cough then turns into violent coughing fits that end with a characteristic, noisy inhalation like a “whoop.” The symptoms persist for several weeks, and an isolated cough may even last several months. Whooping cough is treated with antibiotics. Patients who are not treated will remain contagious for three weeks. The disease can affect all age ranges, but it is particularly dangerous to children under the age of 1, because of the risks of suffocation, pneumonia, and neurological ailments. Epiglottitis is the acute inflammation of the epiglottis, a flap of elastic cartilage that plays an important role in deglutition (swallowing). This infectious disease is most often caused by the Haemophilus influenzae bacterium and chiefly affects unvaccinated children 1 to 6 years of age. It appears suddenly, as a high fever, sore throat, inability to swallow, and difficult, loud breathing. The red, swollen, purulent epiglottis blocks the movement of air to the lungs. Children with epiglottitis adopt a characteristic position (leaning forward with the mouth open) that allows them to breathe better and in which they need to be maintained. The patient's condition worsens quickly (blue coloration of the skin and suffocation), requiring emergency transportation to the hospital, where the flow of air into the respiratory tract can be reestablished and antibiotic treatment administered. Epiglottitis, which has become rare thanks to vaccination, can be very dangerous, even fatal, if not treated in time. Children can be vaccinated at a very young age against a number of infectious diseases: measles, mumps, rubella, chickenpox, whooping cough, hepatitis B, and more. Vaccination allows the body to produce antibodies, which help to fight the development of diseases whose complications can, in some cases, be serious. This preventive technique not only reduces contagion, it can even eradicate diseases. However, some groups criticize mass vaccinations without an evaluation of the risks that these pose for each individual. According to them, the foreign agents contained in a vaccine (virus, bacteria, metals, etc.) may lead to early exhaustion of the immune system and can even provoke autoimmune diseases like multiple sclerosis and leukemia. Nevertheless, in the vast majority of cases, the side effects of vaccination are minor (fever, fatigue, swelling, etc. ), and most specialists agree that the individual risks of vaccination are low, in comparison with the tremendous collective benefit they provide.